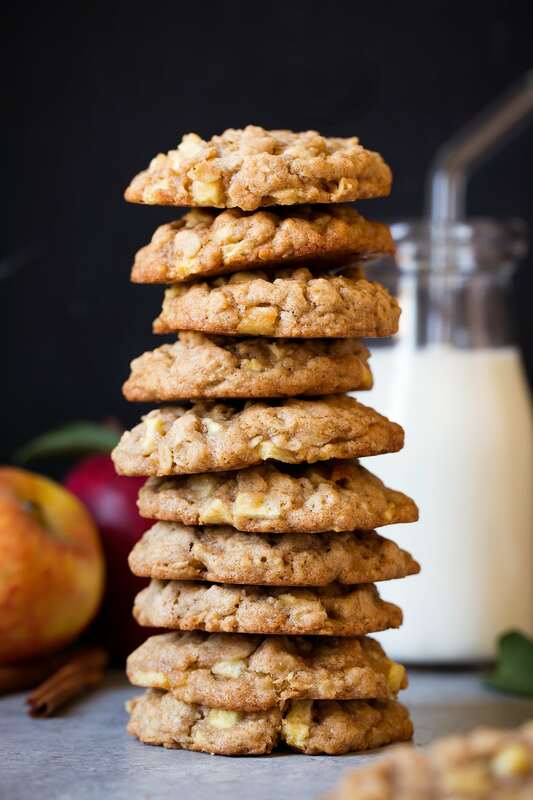 Apple Cinnamon Oatmeal Cookies are the perfect thing to bake any day of the year but I especially love them during fall. 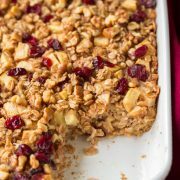 They are soft and cake-like in the middle with chewy, slightly crisp edges, and that delicious apple flavor and abundance of cinnamon will leave everyone craving more! 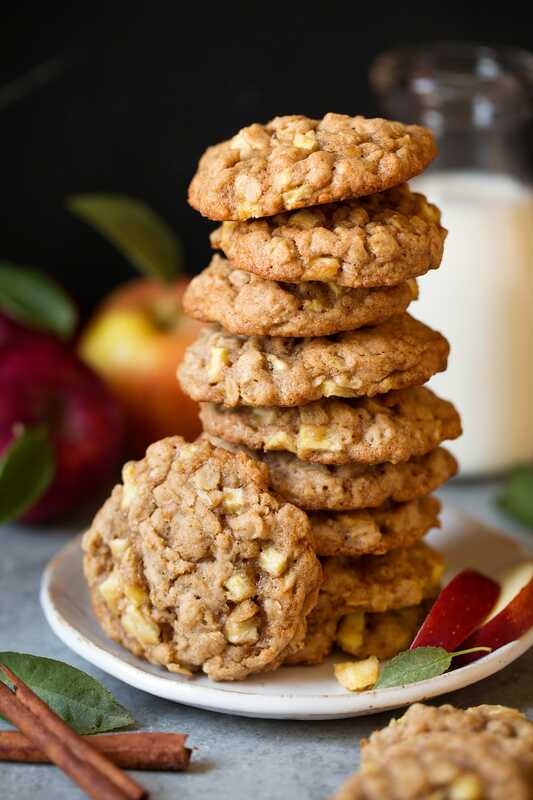 I’ve always loved oatmeal cookies and when you add apples and autumn spices they become the absolute perfect autumn cookie! 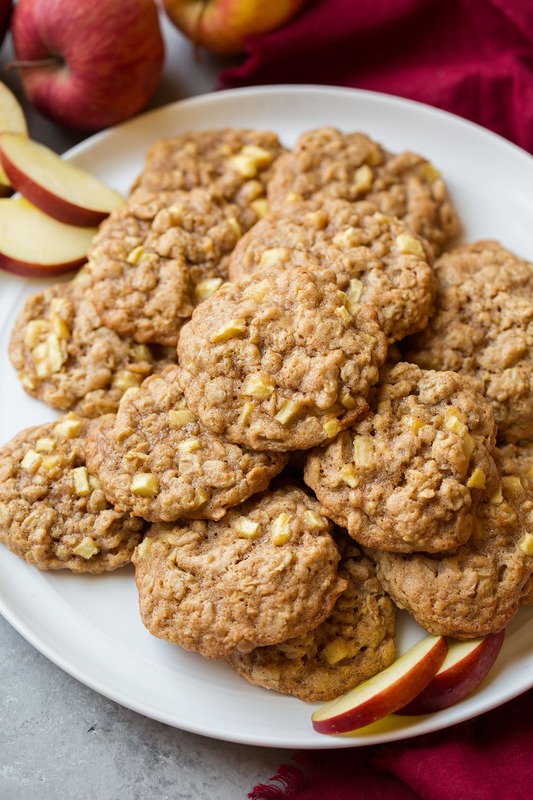 Those tiny little bits of apples in these cookies just make them sing! 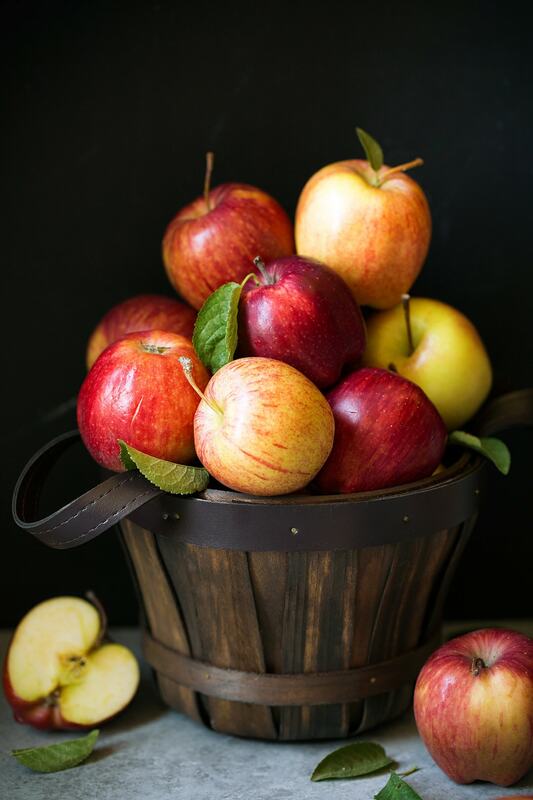 I love how every season has fruits that pair with it, like bright oranges and tempting pomegranate in winter, sweet strawberries and mangos in the spring, juicy watermelon and plump blueberries in the summer, and those crisp apples and mellow pears in the fall. 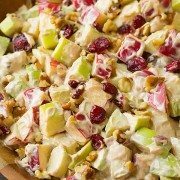 And right now I’m really loving adding apples to everything! From my oatmeal in the morning, to salads at lunch, to my sheet pan meals at dinner, and now here we finish off with apples in our cookies for dessert! Whisk together flour, oats, cinnamon, baking soda and salt. In an electric mixer cream butter and brown sugar. Add flour mixture to dough mix until combined, then mix in apples. Scoop dough out using a medium cookie scoop and drop onto prepared baking sheets. Flatten slightly. Bake in oven until cookies are set. Cool on wire rack. Another tart crisp apple can be substituted for Granny Smith. Don’t use sweet apples though, there’s already enough sugar in the dough. 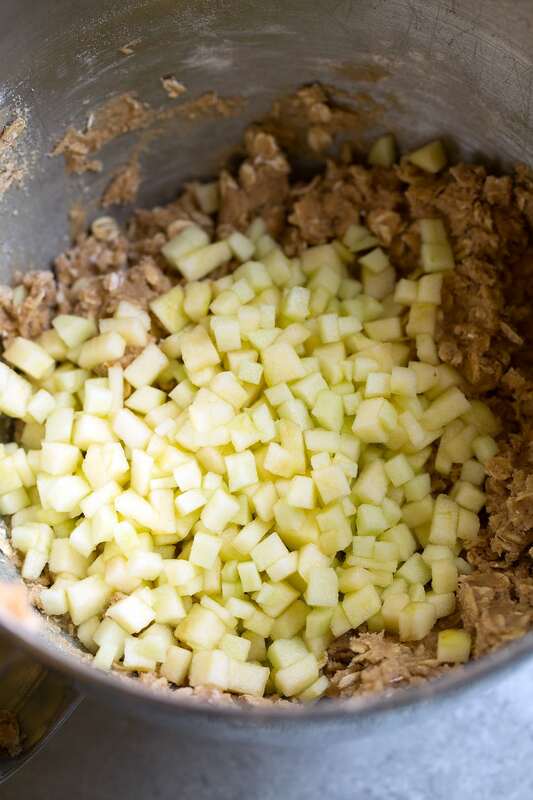 Cut the apples up very very small so not only will they bake through and become tender but that way you’ll also get apples flavor in each and every bite. Don’t omit the lemon, it brightens up the apple flavor a bit more. Don’t use quick oats. 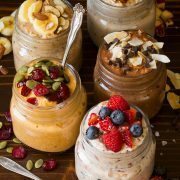 Rolled old fashioned oats will offer the best texture and flavor. Use the scoop and sweep method to measure flour (not spoon and level), or better yet use a kitchen scale for the most consistent results. Use a cookie scoop for the fastest method for scooping out dough, it will also give you even size cookies. For the perfect pairing serve with warm apple cider. A delicious, soft cake-like cookie filled with oats, loaded with tiny chunks of apples and swirled with plenty of cinnamon. The perfect cookie to make on fall weekends! In a mixing bowl whisk together flour, oats, cinnamon, baking soda and salt for 20 seconds, set aside. In the bowl of an electric stand mixer fitted with the paddle attachment cream together butter and brown sugar until combined. Mix in egg and vanilla extract. Toss apples with lemon juice in a small bowl. Add flour mixture to egg and vanilla mixture and mix until combined, then mix in apples. Scoop dough out using a medium cookie scoop, or 2 Tbsp at a time, and drop onto prepared baking sheets spacing cookies 2-inches apart. Flatten them just slightly. Bake one sheet at a time in preheated oven until cookies are set, about 14 - 15 minutes. Let cool on baking sheet several minutes then transfer to a wire rack to cool completely. Store cookies in an airtight container. Use rolled old fashioned oats for best results. Don't substitute quick oats. Dice apples into tiny bites so they cook through and soften by the time cookies are done. Céline: Easy and super delicious! Everyone loved them. Will make them again soon.